Whether you are looking for the perfect accompaniment to a favorite wine or an assortment for a cheese plate, a list of French cheeses can come in handy. There are over 300 cheeses associated with the French and each has unique flavor, texture, and character. While some are interchangeable in recipes, others are not. When you are putting together a list for a cheese and wine tasting, or a cheese and fruit platter you should try to have at least five kinds of cheeses, each with its own distinctive character. For example, you might want to forego the Brie if you have a ripe Camembert on the table, and add something with a hard texture like a well-aged Mimolette. This should not be considered a comprehensive list; books like French Cheeses from Eyewitness Books are more comprehensive and good to have on hand as a reference. Remember that many French cheeses are made with raw milk; the United States does not allow the import of some raw milk cheeses depending on how they were aged and processed. To experience the true flavors of French cheese there is no choice but to take a trip there. Abbaye de Belloc is a hard cheese made from raw sheeps' milk. It has a gray rind and a fine, dense texture rich with fat. The lingering flavor has been compared to caramelized brown sugar with a distinctive scent of lanolin. This semi-hard cheese goes well with red wines. 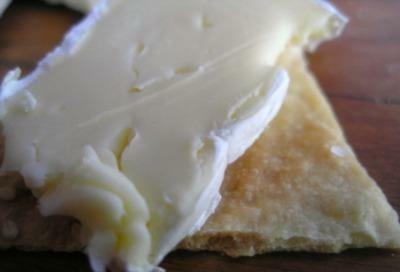 Brie is a well known, popular, soft cheese made from cows' milk. It gets softer and becomes runny as it ages. Brie is an ancient cheese, created sometime before the 700s. Brie is a delicious accompaniment to crisp pears or apples. Pair with a white or red wine such as a Sauvignon Blanc or Beaujolais. Bûcheron is a goat's milk cheese that has been aged for about two months. It develops a tangy flavor close to the rind and gets rich and creamy as you get closer to the center of the cheese. It is also called Buche de Chevre. Serve with a baguette and a good Bordeaux. Camembert is from Normandy. It is a raw milk cheese with a salty, tangy flavor and a gooey texture when it's aged properly. It pairs with Beaujolais, Calvados and apples. Delice is a cow's milk cheese from Burgundy. During the cheese making process, cream is added twice to the milk and it is considered a triple-cream cheese. It is so rich that it almost melts in your mouth with a buttery mouth feel. It has aromas of straw and mushroom, and pairs well with sparkling wines. Edel de Cleron is a pasteurized cheese which is wrapped with pine bark, giving it a woodsy character. It is slightly aged and has a runny interior. This cheese is a wonderful dessert cheese and is, at its best, served with apples, walnuts and Calvados or hard cider. Gaperon is another ancient cheese from the Auvergne region of France. It has been in constant production for at least 1200 years. Made from cow's milk, this cheese has cracked peppercorns and garlic infused in it. During the maturation process, it develops a soft, buttery consistency and garlic-pepper flavor. It pairs well with a red wine. Laguiole is one of the oldest cheese types made in France, dating from the 4th century, BC. It has a tangy, sharp flavor with the delicate hint of the herbs and grasses that the cows eat. The crumbly textured cheese develops natural blue veins as the cheese ages. It pairs well with apples, pears, crusty artisan bread, sausages and smoked ham. This cheese needs a strong wine such as a dry Gaillac. Mimolette cheese dates back to the reign of King Louis XIV. He blocked the import of Dutch cheese into France and the people living in the region of Flanders, with their strong Dutch ties, missed the Dutch cheeses and created Mimolette to replicate their beloved, but no longer available, Edam. Mimolette is a semi-hard cheese that looks like a cantaloupe. It has a bright orange interior and a sweet, mild flavor. It goes well with a Riesling. Roquefort is an ewe's milk cheese, which is creamy white with intense blue marbling throughout. It is a salty, flavorful cheese with a crumbly texture. Pair it with walnuts, figs, green grapes or a rye bread. A sweet wine brings out the flavor of Roquefort; pair it with a dessert wine like Muscat or Port. While you may not be able to find the entire list of French cheeses at your local grocer you can find many of them online. Try any of the following sites for quality, imported French cheeses. Experimenting with French cheeses and wines is a great way to entertain guests. Laying out a beautiful assortment of cheese and fruit and adding a variety of wines doesn't take much preparation and leaves you plenty of time to enjoy your guests. Don't stop with this list. There are hundreds of French cheeses to be experienced and explored.